Significant number of obese people may regain the lost weight after variable length of time post-surgery. Weight regain after bariatric surgery occur due to many factors that range from failure to sustain dietary plan, inadequate exercise/physical activity to sustain a healthy weight. Weight loss surgery has been said to be a means to an end and not the end itself. They must be complemented with healthy diet/dietary habit as well as other lifestyle adjustments such as increased physical activity/exercise. Without these, regaining the already lost weight is inevitable. 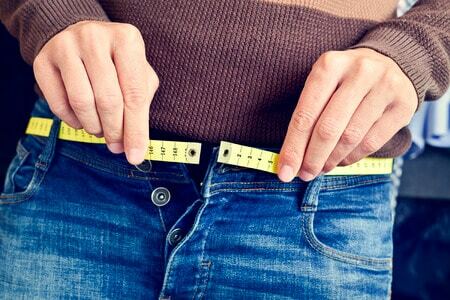 Weight regain after bariatric surgery is often accompanied by worsening of the comorbid conditions such as hypertension, diabetes mellitus, dyslipidemia, sleep apnea. The overall quality of life reduces as the patient regains the already lost weight and the risk of death rises as the weight increases. Reducing the stomach capacity is one of the major mechanisms of inducing weight loss by most bariatric surgeries. While the stomach is reduced to a tubular structure (approximately 10-20% of its original size) in gastric sleeve surgery, a pouch of about 30mls capacity is created to serve as the functioning stomach (with the remaining larger portion rendered useless) in gastric bypass surgery. A similar mechanism is used in gastric banding by partitioning the stomach into a smaller functioning upper part and a larger lower part that only serve as a conduit. In intra-gastric balloon device, the placement of the balloon reduces the space within the stomach leading to early satiety. The reduction in stomach capacity reduces appetite (reduction in the production of an appetite hormone gastrin) as well as food intake (as the stomach gets full with ingestion of little meal). To sustain the low appetite and early satiety, the size of the stomach must remain the same, even years after weight loss surgery. This is often difficult for most patients to sustain due to relaxation in their dietary plan after losing appreciable weight. To prevent pouch dilatation, adherence to dietary plan plays a central role. Eating must stop immediately the sensation of fullness is felt. Eating and drinking should not be done simultaneously but at least 30minutes apart. Alcohol and carbonated drinks should be avoided after gastric sleeve surgery. Exercise is energy consuming. This energy comes from biomolecules such as carbohydrate, fat and protein. With exercise, considerable amount of fat can be burnt. This is why most surgeons will want to see convincing evidence that the patient has commenced exercise targeted at reducing weight before surgery, as this may be a pointer to the likelihood of sustaining such exercise after surgery. Failure to sustain exercise at a level that prevents weight gain, and possibly promote weight loss after bariatric surgery, is a cause of weight regain. Preventing weight regain therefore involves exercise (aerobic, muscle building as well as strength training exercise). A target must be set. The goal is to start small and increase the intensity and duration of the exercise gradually till a healthy weight is achieved. Following the attainment of a stable and healthy weight, the exercise must continue at a level that prevents weight gain. This can be determined by working closely with your dietician and trainer who will calculate your basal metabolic rate, your daily calorie intake and determine the level of exercise that helps you burn excess calorie. In gastric bypass surgery, the pouch (functioning stomach) is separated from the remainder of the stomach (bypassed stomach) by staples. An abnormal connection between the pouch and the bypassed stomach through the staple line (gastro-gastric fistula) is a long-term complication of gastric bypass surgery. Similarly the opening between the pouch and the small intestine known as stoma may become wider with time. These two conditions abolish the restrictive component of gastric bypass surgery leading to increased food intake and weight regain. Weight regain after bariatric surgery can be resolved by evaluating the cause and addressing it. However some causes may require a revision surgery in order to correct them and achieve satisfactory weight loss. The choice of revision surgery depends on the primary bariatric surgery as well as the cause of weight regain. Below are the revision surgeries for common weight loss procedures. Revision surgeries for gastric banding include re-banding, conversion to gastric sleeve, conversion to Roux-en-Y gastric bypass or conversion to duodenal switch. The choice depends on the cause of weight regain. Revision surgeries for weight regain after gastric sleeve surgery are re-sleeving, conversion to gastric bypass surgery or conversion to duodenal switch. The choice depends on the cause of weight regain. Gastric Bypass revisional options include the addition of Lap-Band, lengthening the Roux limb, use of sclerotherapy, trans-oral outlet reduction and conversion to duodenal switch. The choice depends on the cause of weight regain. Nevertheless, after any of these revision surgeries, dietary plan and healthy eating habits must be followed to prevent pouch dilatation. Exercise must continue at a level that induce weight loss or maintain a healthy weight. Joining a support group or a weight loss forum may be of help in ensuring dietary and exercise compliance. Working closely with your surgeon and dietician will go a long way in preventing weight regain. In summary, weight regain after bariatric surgery is a common phenomenon. The common causes are pouch dilatation and inadequate exercise. It is preventable by compliance with the dietary and exercise plans. It is also amenable to correction through revision surgeries.